​Our curriculum is unique to the individual teacher and school as it integrates our faith and includes all teaching and learning experiences. All curriculum in our schools meets and exceeds the minimum learning standard requirements set forth by New York State. Teachers are expected to use a variety of resources to devise lesson plans and tailor instruction to the individual needs of their students. Teachers of all subject areas are encouraged to collaborate to show the connection between subject areas. This encourages students to apply knowledge and skills in preparation for college and careers. Religion is taught daily as a core subject as well as integrated into all subject areas and aspects of the school day. Prayer occurs multiple times daily. The integration of religious values within other subject areas is the constant responsibility of all faculty and staff. Shared Expectations for Excellence in Development guides curriculum and instruction in our schools. It was originally published in August 2013 to replace SHAPE 2000 and Beyond… Sharing High Assessment & Performance Expectations. The Common Core State Standards (CCSS) are the most significant reform to influence Pre-K through 12 education, with regards to curriculum, in the history of New York and the U.S. The goal of the Common Core is for teachers to provide students with the tools and knowledge necessary to achieve goals established by the standards. 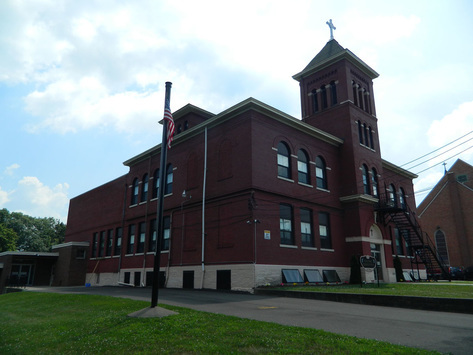 The Diocese of Rochester will embrace the standards to prepare students for middle and high school, beginning at the Pre-K level. Students will encounter an authentic curriculum, including writing workshops, reading clubs, research projects, debates, and math games. Expectations will center on a stronger emphasis of higher-level comprehension skills. Each child’s reading ability will be assessed through comprehension and thoughtful writing. Additionally, students will be able to read and write complex texts, independently, at high levels of expertise and at an effective rate. Literacy will be taught in every classroom. Students will be invited to read more non-fiction texts across the curriculum, as well receive focused ELA instruction in non-fiction reading. With regards to math, students will master concepts and become fluent in basic skills to attempt difficult problem sets. The Common Core will expect all students, of all ages, to be able to sort and categorize, compare and contrast, evaluate, analyze, and reason. • Academic Vocabulary – Students will acquire relevant, grade-level vocabulary. • Students will develop fluency, with speed and accuracy.